The crystal clear 7” LCD Mirror Monitor is a perfect addition to any driver that needs assistance backing up. See the whole world behind you in rich colors. It is also an LCD monitor so it is very light as well as thin. In addition, it has four video inputs so you can connect multiple cameras and a game system or DVD player. when the screen is powered you on you have the option to either watch one camera or all four in a split screen. This monitor is compatible with all our cameras and any car; it connects to any power source or a cigarette lighter. It can mount on your windshield or dashboard (mount included). Super easy installation. The side camera has a 120° Degree viewable angle, its waterproof and has auto night vision. It also swivels so you can point it in the best spot possible. The side camera is perfect for any long RV or Bus. You can mount it on the side facing front or back any see everything in crystal clear quality. You need help parking? This is for you! You need help changing lanes on the freeway? This is a must! The RV Box camera Has a 120° Degree viewable angle, its waterproof and has auto night vision. The camera is one of the most durable we have, with incredible adjustability and night vision clarity. The RV Box camera has a metalsun shield visor to protect you from glare and pebbles. This is by far our toughest built camera. It has been regularly used in cars, vans, buses and even industrial sized caterpillar trucks, operated in the harsh oil sand of Canada. This camera can take a direct hit from a rock and it will still work like new. It has also been very popular with RVs, because its housing allows you to install the cameras on multiple sides of your RV. "I live in new York and i needed 3 wireless cameras to work in harsh weather. I was hoping that buying it in a bundle would save me a few bucks but non the less i was promised that these transmitters are the best. At this point winter is basically over and all 3 transmitters are working great. I am happy with the set up and i will be buying more for my other trucks." "I wanted to convert my backup cameras on all 3 of my vans to wireless, My systems were old but Tadibrothers had all the adapters i needed to use with a system that i didn't even buy from them. 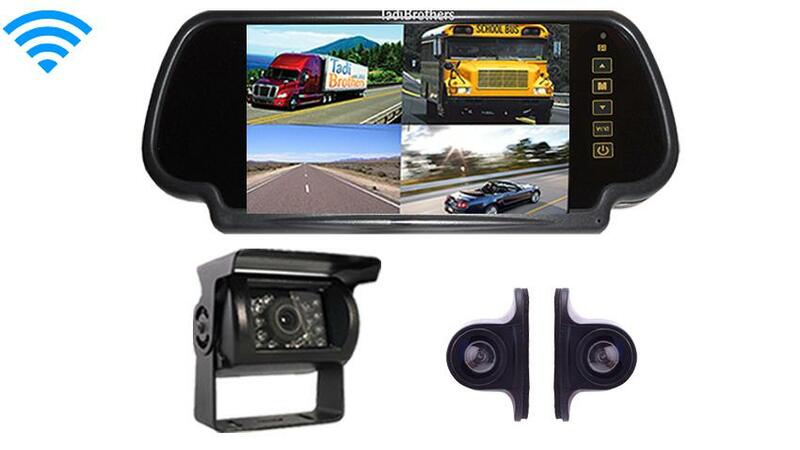 I have been using the cameras as rear view safety systems and the wireless has been great every time i used it"
"I've been using this on my RV system for about 2 Months it works OK, my side cameras work perfectly but the camera in the back has some static when I'm driving down the road. when were parked it perfect. My 5th wheel and truck add up to about 60ft so it does push the limits a little and again it perfect when were parked"
"Purchased and ultimate system, wasn't sure where to put the transmitters, i didn't like how they looked outside so i managed to stick them in the coach. Even though these transmitters are small i am still very impressed with how well the reception is. when designing these transmitters they were thinking of RVrs for sure. I think it was a bit pricey but they do work the best :-)"